- Call if your Area is not listed! Our Tampa lawn care and landscaping design company is a leader in landscape design and maintenance, where quality and total customer satisfaction always come first! 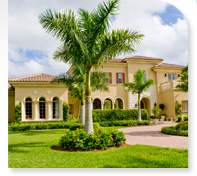 Our Tampa landscaping company has proudly been serving central Florida for over 30 years, and we are dedicated to providing beautiful and unique South Florida landscape designs. We know what we can do well and we choose like-minded partners to work with when the project requires expertise we don't have! We consider this a business of trust when you put the appearance of your property in our hands. While our equipment, knowledge and capabilities are state-of-the-art, we are old-fashioned about the values on which we’ve built our business – integrity, reliability and personalized service. We currently maintain over 500 residential and commercial properties throughout central and eastern Florida and all of our customers rely on our professionalism. Our Tampa lawn care and landscaping professionals will be there for you—even when it’s not easy to understand and be responsive to your individual needs—and to do it with a friendly, caring attitude. This will be my team’s commitment to you—a great South Florida landscape complete with a smile. Welcome to our Tampa Landscaping Company!